I heard of Empanadas long before I ever had one – of families getting together to make dozens for holidays. I can only imagine the labor of love. There’s no need to wait for a holiday, though, if you just want a few. Sure, they’re a little involved to make but with a good dough recipe, it goes much easier. It also goes easier if you’re not making a filling from scratch: I make Empanadas like these Chipotle Pulled Pork Empanadas all the time from what’s in my fridge or from a “planned leftover.” That’s just what it sounds like – I’ll make extra of something just so I can use it later in another dish. 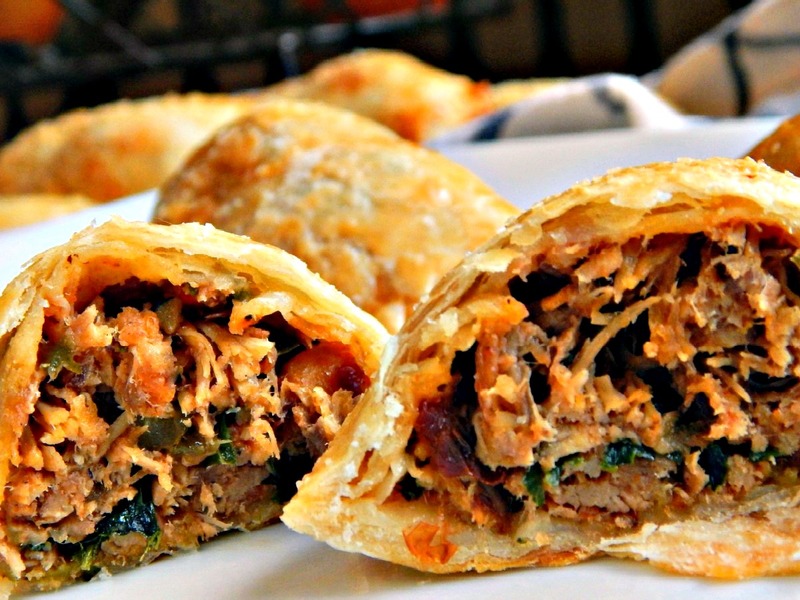 These Chipotle Pulled Pork Empanadas start with Pulled Pork in the Slow Cooker & the Empanada recipe is below, but there’s no need to limit yourself. Check out this DC Empanada food truck’s menu for inspiration! So next time you have any kind of soft, braised leftovers, just about anything that will shred (it can’t be too pokey or it will make a hole in the dough) think about making some Empanadas. What flavor would you come up with? You’ll need four cups of filling mixture for my dough if the dough is rolled according to the instructions, about 1/8″ thick and cut into five-inch rounds. This makes 12, each with 1/3 of a cup of filling. Other amounts, smaller or larger may leave you with a little too much filling or too much dough. Not the end of the world, but still. Use any combination of shredded meat or poultry (or go vegetarian) and cooked vegetables. I like about two cups of shredded beef, chicken or pork and two cups of cooked vegetables. Add some cheese if you’d like; a 1/2 a cup or so doesn’t make much difference in volume, but if you use more, reduce the amount of vegetables or meat by a bit – not by a straight one to one ratio, because the cheese melts into nothing – for a cup of cheese, I’d reduce the rest of the filling by about a half a cup. Remember, it all has to fit inside the round of dough! You’ll just have to guesstimate if you’re going to cook vegetables for made up Empanadas – I’d say three cups of raw veggies in a small dice will generally amount to around two cups cooked, but this varies. If you come up short of the four cups of filling, add a few more veggies to the filling or add frozen peas or corn, dice up some potato, sweet potato or carrot and microwave it for a minute or two, or root through the fridge to see what might work. See how no moisture seeps into the trough here? When you cook up the filling , you’ll need to add a little water or broth and let the filling simmer with whatever spices or sauces you add, for a few minutes, at least, just to combine and meld the flavors. When the filling is moist, but a spoon is run through, exposing the bottom, and no juices flow into the space left behind, you’ll know your filling is perfect – not too wet and not too dry. Let your filling cool before assembling the Empanada. One more hint! After making the Empanadas, they seem to hold their seal better and bake up flakier if refrigerated for 1/2 an hour, covered, before being brushed with egg wash and baked. I didn’t think to do this with this batch and a few did open. This recipe is marvelous but be sure to read the post if you want all the hints and help to fashion up your own. Add oil to a large skillet, heat and saute onions and sweet potato for several minutes, until the sweet potato has softened. Add the bell peppers and saute until tender but still a little crisp. Add the pork, water, minced Chipotle pepper, and kale, stir to mix. Add honey and salt and pepper to taste. Cook until the moisture is mostly evaporated and a spoon, run across the bottom to separate the ingredients leaves a dry path. Cool completely. When cool and Empanada dough is ready, if cooking right away, preheat oven to 425 degrees. (Note: I’ve noticed if Empanadas are filled and refrigerated for a half an hour before cooking, the dough seems flakier and they seem to have a better seal. If you are going to refrigerate before cooking, hold off on the preheating and the egg wash!) Add a piece of parchment to a cookie sheet, mix egg and water for a wash.
To each round of dough, wet one half of the inside edge with egg wash. Fill with 1/3 cup of filling. Fold so the egg wash side meets the side without: I find this easiest to do in the palm of my hand. I place the dough in my palm, brush 1/2 with the egg wash, add the filling. With the other hand, I pinch the top edges closed, then pinch down each side to the points. Brush each Empanada with egg wash and place on parchment-lined baking sheet. Sprinkle with a little bit of sea salt. Bake at 425 until dough is browned and cooked through, 20 to 25 minutes or so. Ovens vary, and the temperature is hot, so check at 15 and keep checking! This recipe doubles easily and Empanadas freeze very well before they’re cooked. Simply make the Empanadas, but don’t brush with the egg wash. Lay them out on a flat surface in the freezer, preferably a surface covered with parchment. When frozen, wrap each individually and put into a larger bag or bags if desired. Time does not include the dough and is based on starting with a cooked protein. This entry was posted in Click here for Bargain Meals, Click here for Fabulous Food Posts and tagged Appetizer, Bargain Meal of the Week, Bell Peppers, Chipotle, Empanadas, Greens, Hot Peppers, Kale, Latin American, leftover pork, Leftovers, Mexican or Southwestern, Pastry, Pork, Pulled Pork, Sweet potato. Bookmark the permalink. Perhaps it’s too early and I haven’t had enough coffee yet, do I freeze them prior to baking or after baking and then just crisp them up again when it’s time to eat? These look amazing and I can’t wait to use up our pulled pork with them! I like to fill & seal empanadas, then refrigerate for 30 minutes. Then take them out, make sure they’re all tightly sealed, brush them with the eggwash and bake them. If I freeze emanadas for later, I fill and seal them, lay them out on parchment paper on a cookie sheet or something flat and freeze. Then I put them in a ziploc and store. When ready to bake, I take them out, brush them with eggwash and bake for just a little longer than normal. I don’t thaw them. These were a big hit with the family! Everyone loved them! We used spinach instead of kale and it turned out great. I need to make some pulled pork now! I’ve never met an empanada I didn’t like. Thanks, Bonnie! I’ll take that as a high compliment, given the marvelous photography in your blog! I think I’m getting a little better here and there, but these were a good subject. And they stood still! 🙂 Seriously, they’re very delicious. 🙂 It would be very good with all vegetables! Or even the vegetables all cooked together, seasoned like this and served with rice would be great! Yay!! We NEEDED more empanadas at the fiesta!! I am making these ASAP!! I love that you have the link to the DC empanada truck menu- I have the NYC empanada menu in my kitchen for inspiration!! My son wanted me to make the “spicy chicken” version we had in NYC- I think these would do the trick ;). They look SO GOOD!! Thanks so much! I thought about holding off on the post in deference to yours, but what the heck – it’s a party! 🙂 Spicy chicken sounds fantastic – you’ll need more Chipotle! These are only mildy spicy! I love the way your healthier crust turned out and am going to have to try it! Frugal indeed with some planning but you’d never know from looking at these. I’d love to have some right now for munching on. I’d definitely go with the baked version as with the beaten egg wash you get a lovely looking empanada. You know that’s so true, being frugal is ALL about the planning! 🙂 Well, I like the fried better, but I so rarely fry anything!